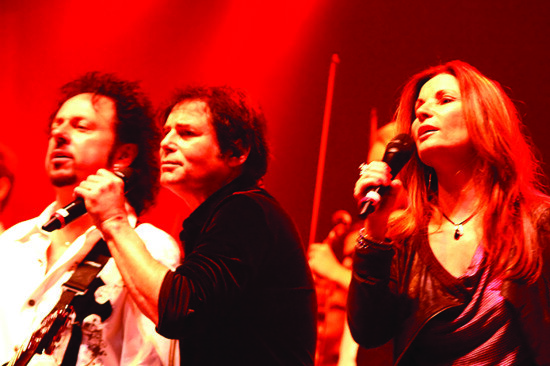 Many rock bands have recorded albums with a full orchestra, including such luminaries as Deep Purple and Scorpions. However, I must admit to never having taken the time to listen to such albums – a situation that is surely going to be remedied after this magical night. 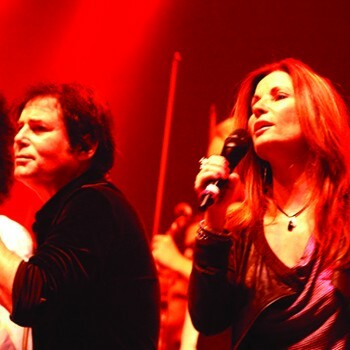 Ostensibly flying over to Germany to meet Robin Beck and have the opportunity to see her playing live, I really was not sure what to expect from this tour, featuring a host of well-known vocalists performing some of their best loved songs with the backing of Prague’s Bohemian Symphony Orchestra. Okay, so the orchestra provided the ‘classic’ part of the evening, but the ‘rock’ element was more than taken care of with a house band consisting of Mat Sinner on bass (also the musical director for the tour) along with guitarists Alexander Beyroth and Oliver Hartmann and Jimmy Kresic on keyboards. The all-star backing choir included the likes of Ralph Scheepers (Primal Fear), Amanda Somerville, X Factor finalist Tiffany Kirkland, Verena AkaNena and German musical star Sasha Krebs, along with several others of whom I had no idea who they were, but who all provided exquisite backing for all the artists on the night. First up was Jimi Jamison, and after witnessing a superlative set at Firefest a mere two months prior, I knew the newly reinstated Survivor vocalist would not let us down – and that was the case as he led us through a brief five-song highlight of his career, opening with the superlative ‘Burning Heart’ and finishing, of course, with ‘Eye of the Tiger’, by way of ‘The Search Is Over’, ‘Didn’t Know it Was Love’ and ‘Can’t Hold Back’. Although Jimi and the band were on top form, at times I was straining to actually hear the orchestra, and was wondering what the whole point of this exercise was. Next up, Robin Beck. For almost 25 years I have been waiting to hear this lady sing and she doesn’t disappoint. A mere three songs, but even in this short time it is evident that the voice that intoxicated a generation has maintained all its power and verve, and with second song, ‘Tears in the Rain’, the feelings and emotions within the arena are palpable, the violin solo only adding to what was already one of the special memories of the night. And if Robin should ever lose that voice, she could make a pretty decent career as a stand-up comedian, and her amusing interaction with the crowd belies the nerves she feels before going on stage. But of course, it is that song that everyone wants to hear, and during ‘First Time’, the lighters in the audience come out, and we all, as one, applaud the sheer beauty and brilliance that is Robin Beck. A superlative performance, and one that beckons really well for Firefest later this year. This girl was made for the stage, and hopefully the next few years should see her back where she belongs. If I’m being brutally honest, I was only really looking forward to seeing Robin Beck and Jimi Jamison, and could quite happily have left before Steve Lukather and Ian Gillan had performed. However, by the end of the night there were not enough superlatives to describe just how wonderful the sets by both these artists were. The main reason for this was that while the orchestra had been mainly just a tool for backing Jimi and Robin, it actually seemed that time had been taken to carefully rearrange the songs for both Lukather and Gillan to maximise the potential of the classical format. Thus, the performances of both singers was nothing short of jaw-dropping. ‘Rosanna’ and ‘Africa’ are taken to another level, particularly the latter with the backing of the choir, while ‘I’ll Be Over You’ and ‘While My Guitar Gently Weeps’ form the emotional backbone of the set. ‘Hold the Line’ finishes in true hard rocking fashion, Tiffany Kirkland sharing vocal duties and proving what a potentially lucrative future she has. Pure class all round. However, it is left to the elder statesman Ian Gillan to finish the night, and with a wonderful choice of songs this really is the cherry on the cake. Opening with the monster rocking ‘Highway Star’, it is an awesome sight to see the orchestra going full pelt, especially the head-banging flautist in the back row! The perfect combination of the more recent ‘ ‘Knocking on Your Back Door’ and Perfect Strangers’ both benefit from wonderful new orchestral arrangements, but it’s the hard rocking trio of ‘Woman From Tokyo’, ‘Hush’ and encore ‘Smoke on the Water’, when all vocalists come back out on stage for a fitting finale, that truly bring the house down. Seriously, it is a crime that such a unique and spell-binding tour has never made its way over to the UK. I’m sure that many in the crowd were actually classical music fans first and foremost, but if such a concept can help bring rock to a wider, more appreciative audience, then that can’t be a bad thing. And having a full orchestra complementing a hard rock band on stage adds that extra something special, that unique ingredient that lifts an excellent performance into something so much more, and all those involved in such a wonderful enterprise should be congratulated on their risk management and foresight. An opportunity not to be missed if you ever have the chance.